The Girl in the Spider's Web by David Lagercrantz- I've heard good things about this "fourth book" of the "Girl with the Dragon's Tattoo" trilogy. So, I'm looking forward to catching back up with Lizabeth Sander. The Tempress by Paul Spice- The true story of a 1920s femme fatale? Interested! At Bertram's Hotel by Agatha Christie- Because sometimes a girl just needs a little visit with Miss Marple. The Zookeeper's Wife by Diane Ackerman- Another true story. The Zabinski's helped Polish Jews by hiding them in their zoo. Serving as a safe haven for many as they were smuggled out of the country. There's a movie coming out based on it. 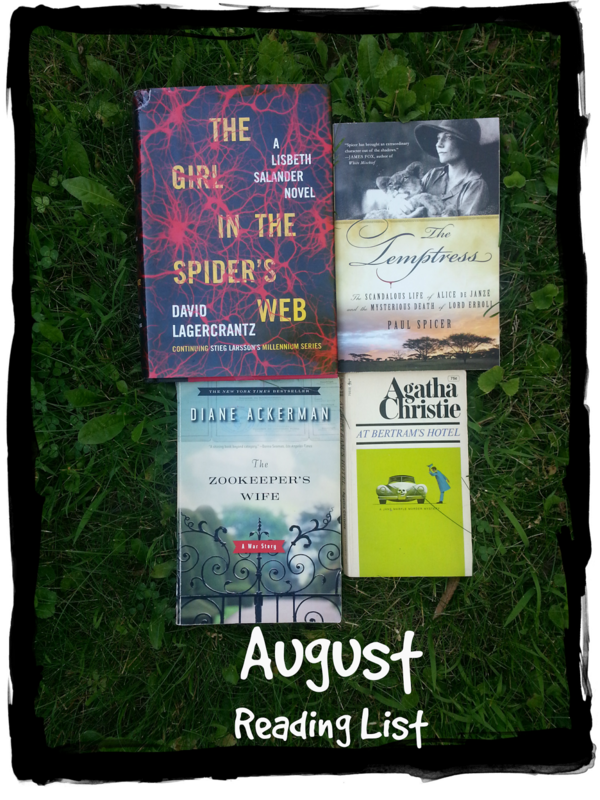 What's on your August reading list? Girl in the Spider's Web...he did a great job of picking up the series. Really enjoyoed it. And you can't go wrong revisiting Agatha Christie. Try Magpie Murders by Horowitz to continue in that vein. A new book and a good read. Thanks for the recommendation! I'll have to keep an eye out for it!